Pier 4 developers have proposed using special flood barriers to protect new buildings. 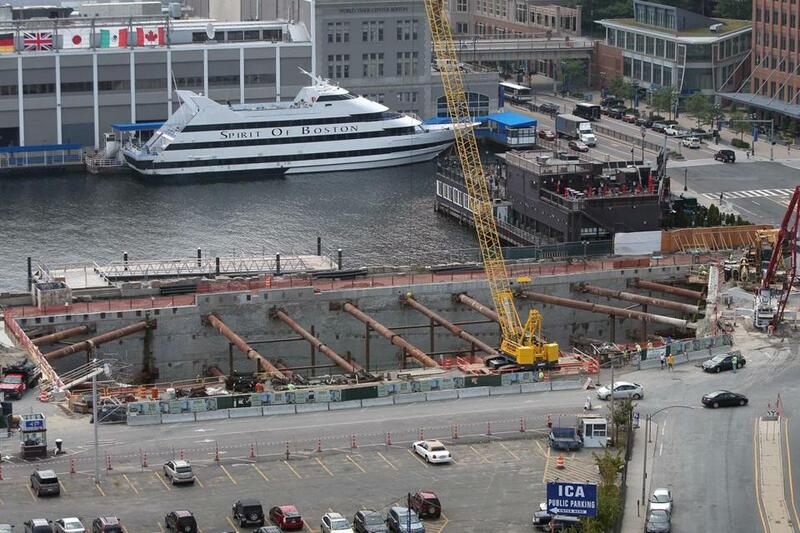 Boston’s effort to redevelop its waterfront is running into a major obstacle: Water. From downtown to East Boston to Dorchester, rising sea levels are posing an increasingly urgent threat to developers’ plans to build hundreds of homes, offices, stores, and parks along Boston Harbor, with many acknowledging the need to reinforce existing properties and redesign new ones in case of flooding from another Hurricane Sandy-like storm. Several building owners are already preparing for the growing possibility of flood waters. At Fan Pier, developer Joseph Fallon has moved critical electrical systems higher in his buildings. Nearby, developers of a residential tower at Pier 4 are proposing to use special flood barriers for lower entrances. And the newly built Spaulding Rehabilitation Hospital in Charlestown is surrounded by protective walls and landscaping buffers, and no patient programs are located on the ground floor. In Boston, a city with more than $460 billion in real estate assets along the water, sea levels, projected to rise two feet by 2050, are not just an environmental concern, but a potent economic threat. Even now many waterfront buildings are only a few feet above the tide line, and a single storm surge could swiftly inflict massive financial losses and shut businesses for weeks — a combination that cost the New York area $50 billion after Sandy hit last year. Mayor Thomas M. Menino’s administration is currently assessing the city’s vulnerabilities and options to strengthen coastal protections and safeguard waterfront properties. In many ways, the threat of rising sea levels is an exasperating irony for Boston, which has spent billions of dollars to reconnect the city to its harbor, only to have the water emerge as a major physical and economic threat. Menino aides have said development along the harbor can still thrive with proper precautions. The threat of flooding has become a focal point of city-led discussions on improving waterfront properties between downtown and Dorchester, where a number of developers are designing new buildings and multimillion dollar improvements. Shen and others acknowledged that securing the waterfront won’t be easy. Boston is particularly susceptible to coastal flooding because many of its historic wharves and skyscrapers were constructed on filled tidelands that now sit in the water’s path. Seas along the East Coast are rising three to four times faster than the global average, according to the US Geological Survey. Multiple environmental studies have predicted the sea level around Boston will rise between one and two feet in the next 35 years, making the region more vulnerable to severe storms that are striking with increasing frequency. A study by the Boston Harbor Association, an environmental advocacy group, asserted that a major storm under those higher water conditions could quickly submerge much of the city, including large sections of the Back Bay, East Boston, the North End, Dorchester, and other neighborhoods. Indeed, had Sandy hit Boston at high tide last October instead of low tide, the group asserted, nearly 6 percent of Boston would have flooded, including much of downtown. Under future conditions, with a sea level rise of just 2.5 feet, a Sandy-sized storm could inundate 30 percent of the city. Any lingering skepticism about climate change in the real estate industry was swiftly erased by Hurricane Sandy. The storm sent a wall of water cascading through lower Manhattan, flooding subway tunnels, knocking out electricity, and shutting skyscrapers. One office tower owned by Boston-based Beacon Capital Partners was shut for 45 days after six feet of water flowed into the lobby. The parking garage of the 36-story Financial Square tower on the East River was flooded with 11 million gallons of water within 45-minutes, swamping electrical vaults and other critical equipment, Beacon Capital official Alfred Scaramelli told a gathering of Boston real estate executives recently. A panel appointed by the Menino administration, known as the Green Ribbon Commission, recommended in a new report last week that property owners should consider, among other precautions, building flood walls, installing permeable pavement and landscaping buffers, reinforcing doors and windows to withstand flooding and high winds, and acquiring backup power and water sources in case of an emergency. But the effort is only at its beginning stages, and officials do not yet know whether regulatory changes will be necessary to mandate renovations to homes and commercial properties, or whether government assistance will be offered to help pay for the improvements. Owners of buildings under construction along the water have already begun to take steps to secure their properties on their own. The developers of a 21-story residential tower at Pier 4 in the South Boston Innovation District are seeking to acquire special flood barriers to cover doors and parking garage entrances, and many others have sandbags at the ready in case of a major storm. Executives at Pier 4, which is being led by the Hanover Co., had considered raising the building’s ground floor to gain greater clearance from flooding, but that would have made it more difficult and expensive to preserve handicapped accessibility, requiring a series of ramps into the building from the street. The challenges for existing buildings are even more complicated. During a recent meeting on waterfront development, the owners of 255 State Street, an office building at Long Wharf in Boston, said the encroachment of water will eventually force them to relocate utilities to a higher floor. That would mean losing rentable space, cutting into the building’s income and tax revenue for the city. Shen, Boston’s chief planner, said the city will consider incentives to help secure buildings from flooding. But he declined to say whether those incentives would include financial support or expedited permitting, noting that officials are still trying to determine which properties are most vulnerable, and consulting owners and threatened neighborhoods about possible safeguards.